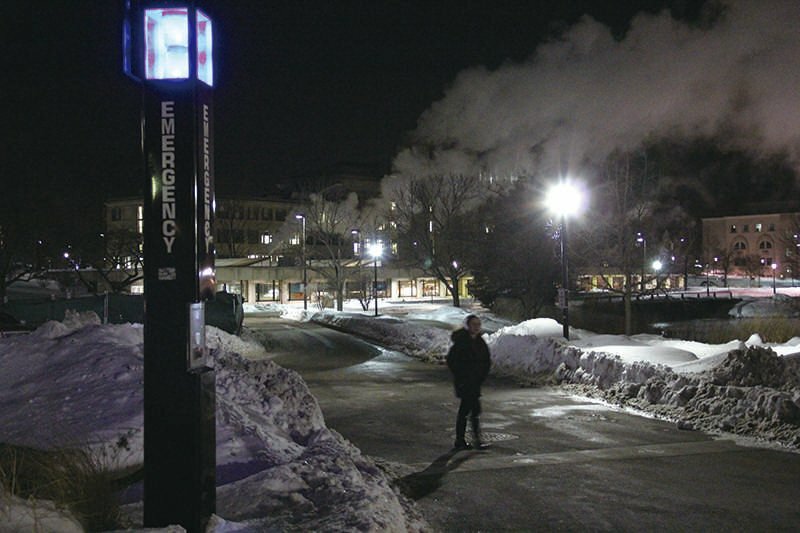 The “Blue Light” telephone outside of Norris University Center is one of about 90 emergency telephones on campus. University Police has not seen a high level regarding on-campus security cameras, some of which are located on top of the phones. As the city encounters resistance from residents worried about plans to line the streets leading to Evanston Township High School with cameras, University Police say surveillance has become an integral enforcement tool that doesn’t raise too many privacy concerns. The 800 cameras around NU’s campuses have helped deter crime, identify suspects and strengthen the department’s enforcement tools, police said. The University will add more cameras upon completion of construction projects including the Music and Communication building and the North Campus Parking Structure. The cameras will be especially prevalent in the parking structures, with placement in elevator lobbies and throughout the parking levels. UP’s surveillance policy published in 2006 limits where cameras can be placed in on-campus housing facilities. In residence halls, cameras are located at entrance areas,UP deputy chief Dan McAleer said. In academic buildings, cameras are usually placed at the entrance of the buildings and sometimes in auditoriums, said Merrill Silverman, director of parking and university security systems. Cameras positioned at Ryan Field have high zoom capacity. Footage is also used to review car incidents in the school’s parking lots. Cameras are also positioned at each of about 90 emergency phone stations across campus, Silverman said. At a Northwestern fraternity, some students said they were uncomfortable with the position of cameras looking down a stairwell, McAleer said. Police only review camera footage to detect criminal activity and not to monitor more minor violations. The University’s dispatch center has the ability to access footage of crimes from the security cameras. UP, however, are not paid to view surveillance cameras, Silverman said. “There are so many cameras no one person can go in and adequately monitor cameras,” he said. Cameras are prevalent on NU’s Evanston campus during Dillo Day, Mayor Elizabeth Tisdahl told The Daily in January. During the annual music event, police bring in additional cameras, McAleer said. In general, UP pair security cameras with card swipe entrances and emergency phones to increase security on campus. Although there is no specific budget for surveillance, funding is allotted for planned cameras at the new construction projects. The upcoming additions are part of an increasing University reliance on security cameras. In 2011, the University announced it was adding 65 cameras to the Chicago campus and 30 in and around the Technological Institute. The Undergraduate Budget Priorities Committee requested additional cameras at Tech, which were placed at the entrances and hallways connecting buildings, Tech Plaza and the exterior of the building.